Beverages makers throughout the United States rely on Southeast Bottling & Beverage as their copacker of choice. Southeast Bottling & Beverage is an energy drink, flavored water, sports drink, tea, liquid dietary supplement, functional drink and juice bottling company that has been serving the bottling and copacking needs of beverage manufacturers for decades. Our facility is top of the line and contains everything you could need to expertly copack your ready-to-drink (RTD) products. Built to cGMP (Current Good Manufacturing Practice) regulations, our facility has unique filling rooms, a separate pharmacy, an air-conditioned warehouse for raw ingredients, on-site refrigerated storage and much more. We also offer multiple mixing technologies, registered film or carton packaging, hot fill pasteurization, and plastic bottles ranging from 8oz to 32oz, so we truly can be your single copack provider. Another reason we are a preferred tea, supplement and juice bottling company is our commitment to quality control. Our facility holds multiple certifications. We are Organic, Kosher and HEPA Filtration Certified, and we also maintain an SQF Level III Certification. As an SQF facility, you can rely on us to ensure that not just safety – but quality – standards are met on every production run. Southeast Bottling & Beverage is renowned throughout the industry for providing custom, turnkey copacking solutions to clients of all sizes. Whether you are looking to break into the beverage market for the very first time or need to expand your operations to ramp up production, our team can help. 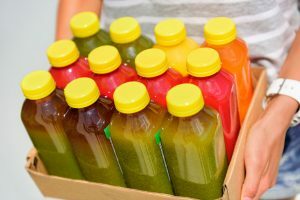 If you are a beverage maker in Florida, New Jersey, New York, Georgia, Texas, Alabama, South Carolina or elsewhere throughout the US and are looking for a flavored water, sports drink, energy drink, liquid dietary supplement, functional drink, tea or juice bottling company, look no further than Southeast Bottling & Beverage. Contact us today to speak to our experts about your next RTD production run. Our SQF facility has everything you need to make top-quality products and get them on store shelves fast.